Welcome to our Website. We believe by taking a tour, and getting an idea of the benefits of developing self awareness, you will take up our invitation to make contact for a more personal discussion on how we will meet your needs. Self Awareness Coaching is about enabling and empowering. It’s a window of opportunity for personal and professional development, using relationship to make stronger, healthier connections for lasting change. Our goal is to identify and develop personal strengths whilst overcoming the challenges created from under-developed self awareness. Self Awareness Coaching develops potential in a specific aspect of living. However it can go much further, developing insights that can enable a wholly fulfilled, engaged and contented life. 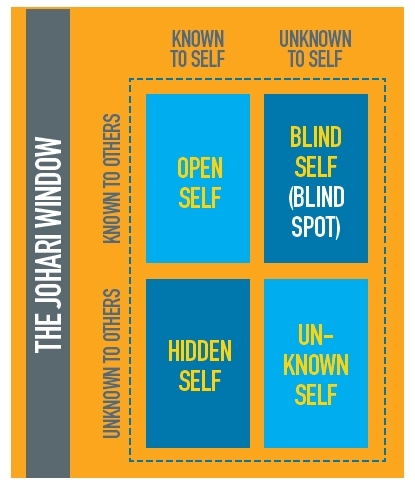 Amongst many other techniques the Johari Window model, in particular, demonstrates the rich vein of growth that can be achieved through developed self awareness. Living a fulfilled engaged life means meeting and overcoming challenges and is a task for all of us. There are everyday challenges and there are once-in-a-lifetime challenges. Meeting any of these challenges involves various psychological processes with Self Awareness at their heart – and realistic success is always achievable. Considering two broad areas; the ‘Everyday’ and the ‘Once in a Lifetime’ offers a useful and pragmatic starting point. It’s worth noting that these two categories are not always so clear and straightforward but they do provide an initial focus. Whether one to one, small groups or business & corporate situations, it’s important to consider carefully how a series of coaching sessions can provide the most leverage for change. An initial consultation will enable us to develop the optimum coaching program, whether personal or professional. We will decide together the most effective approach to get the most effective results.